February 21, 2015, part 1 of 1. In March 2007 Australian David Hicks was convicted under US law on the single charge of "providing material support for terrorism". The successful prosecution of Hicks was a huge PR win for the Bush regime and the credibility of the whole "war on terror" and specifically the way in which suspected terrorists were being handled in Afghanistan, Guantanamo Bay and various black sites around the world. The fact that Hicks's conviction has now been reversed is a glaring indication that the legitimacy of the whole enterprise is in doubt, at the highest legal levels within the US. January 24, 2015, part 1 of 2. January 24, 2015, part 2 of 2. In the first hour of today's show we take a look at several high profile cases involving imprisonment of Australians overseas. 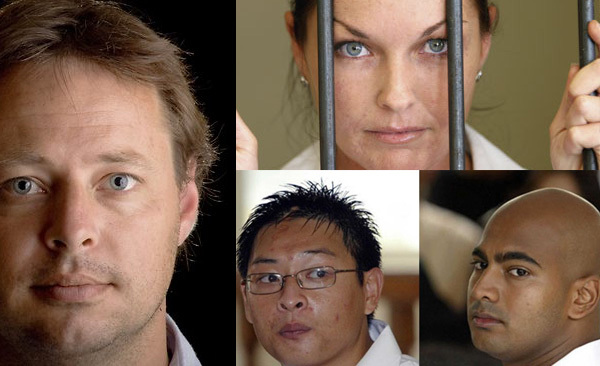 We present a theory the Schapelle Corby and the Bali Nine cases are connected, in that the arrest of the Bali Nine was deliberately orchestrated by the Australian Federal Police shortly before the conclusion of the Corby trial. Was this an attempt by the Australians to appease the Indonesian government and perhaps get a more favourable outcome for Schapelle, whom they knew to be innocent? We also take a look at recent startling news that convicted terrorism supporter David Hicks may soon be exonerated on all charges.